Two Weird Ladies are comedic duo Laura Salvas and Mandy Sellers, two BFFs who found each other studying comedy at The Second City. In their attack of the Toronto Fringe Festival this year, they have prepared a show that is irreverent, hilarious, unafraid to pull punches…and drop bombs. As the two ladies start off their show with a ukulele based medley of loving birthday songs to their aging grandmother reminding the dear old bitty that she may only have a single year left to live and where is her will with their names in it? I anticipated an afternoon full of laughs. Laura and Mandy perform in true form, high energy, well thought-out segments of comedic gold, perfectly executed like a synchronized swim team. I didn’t have the chance to look through the program until after the show but I was distinctly reminded of the laughs coming from Saturday Night Live and proved correct when I read of the entire team’s Second City background. The dialogue is raunchy and rather adult so bear in mind that this comedic tromp is not meant for all audiences. With numerous musical breaks, dance numbers, and laughs stemming from one of the best tools of comedy, timed repetition, Two Weird Ladies Bomb the Fringe is enough to keep you on your toes while bursting at the seems from laughter. The content happily rips into street fundraising for charities, blind dates, women’s fanaticism with body image, reaching for dreams, televised charities, and a bomb. That bomb in the title is not a figure of speech. Part of the ongoing sketch involved Mandy putting a self-loving kibosh on all of Laura’s ideas placing herself on center stage and having it all end in a big kaboom. As each sketch now responds to the impending doom of a bomb aimed at the theatre, the performance comes to an explosive end. 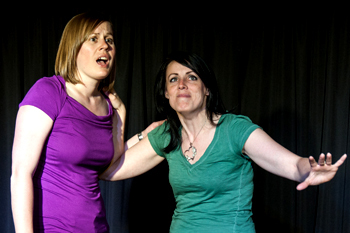 For an hour of fun and laughter, make a date with Two Weird Ladies while making your way around Fringe this year. And watch out! All individual Fringe tickets are $10 at the door (cash only). Tickets are also available online at www.fringetoronto.com, by phone at 416-966-1062, or in person at The Randolph Centre for the Arts, 736 Bathurst Street (Advance tickets are $11 – $9+$2 service charge). Photo of Mandy Sellers and Laura Salvas by Kevin Thom.